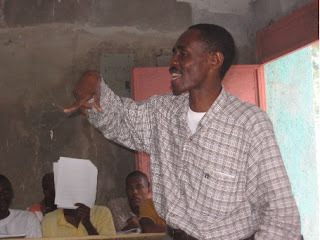 Community Human Rights Council Launched At Bainet-by-the-Sea | HURAH! 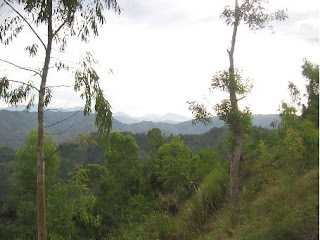 Leaving the capital of Port-Au-Prince for the south east provides breathtaking beauty of the mountains Haiti is famous for. But 10 hours (coming and going) on washed out dirt roads to give 4 hours of a seminar on human rights has to take the prize for dedication to a cause. We were squeezed 4 in the back and two in the front of our land rover which proved a good match for the at times mud pools and deeply rutted steep hills. Breathtaking beauty just the same and a totally different world from the teeming capital. The winding and roller coaster hill roads pass through rock walls with many tumbled down rocks, through a couple of rivers. It is amazing to see that people actually live and apparently are at home here. The temperature is more pleasant. The hills are verdant. Lots of corn growing. Many beasts of burden used for transportation as well as mopeds. 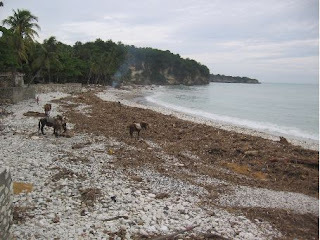 Bainet is a sea town (78,000 pop) in the south east near the more famous cinema festival town of Jacmel. We went there at the request of friends and families of an AUMOHD volunteer lawyer, Bainet-born Atty. Toussaint. 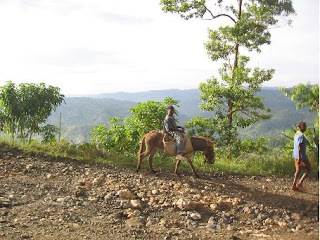 Bainet probably was a quaint resort town back in the days of the Duvalier dictatorship–you can see the beach is only attractive to the donkeys– but now seems to be pretty hard hit by all the ills of Haiti’s hard times. In looking up this town on Google I found several organizations dedicated to improving the quality of life there–schools, clinics, etc. The town celebrated its patron saints, Peter and Paul, this past summer in a huge celebration that included all sorts of dignitaries, politicians, UN personnel. It sounded like a huge and important celebration. But I read nothing in the report about human rights and the needs of the people, just the merits of following in the footsteps of Peter and Paul. Still, given all the panoply of the church and political presence in this place, I had to wonder whether our outreach was really needed. 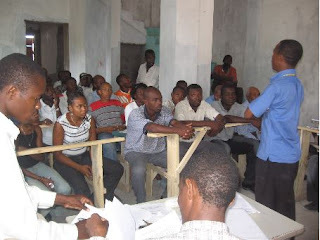 The people of Bainet had heard about the model of a Community Human Rights Council (CHRC) which AUMOHD has been building in 4 of the inner city zones of the capital from Bainet native and AUMOHD volunteer lawyer, Atty. Toussaint. They wanted to gear up to advocate for their rights with this model apparently because they didn’t feel recognized or empowered to work for them. To judge from the attendance (50+), the attention span, the questioning, the signups for follow-up, the CHRC model has a lot of credibility. Atty Fanfan presented a thorough study (with a handout) of the refinements of human rights citing international documents as well as the Haitian constitution of 1987. He received lots of heads nodding in agreement about the difficulty of establishing and maintaining a state with respect for human rights and that a new model was needed–non-political, non-violent–to move forward with an improvement in the lives of people in Haiti. His talk with a question period lasted over an hour. Atty. Toussaint went into more detail with definitions and case examples (with handouts) in the advocacy for human rights during another hour presentation with questions. More than 8 different sectors signed up to form the new CHRC–clergy, school professionals, community activists, women and young people reps. There were no politicians or political party people in attendance and it was clear that the purposes of the CHRC model were not being met by existing organizations. AUMOHD is obviously fulfilling a felt-need. There was no charge for this service–as is the case for all its services–but there are costs involved, namely, transportation (including wear and tear on the vehicle) printing, and food. Think about helping AUMOHD by contributing through GOOGLE on our website. Google no longer charges non-profits!! !